At our house, the latest disc taking up permanent residence in the DVD player is "The Sound of Music." I've been struck anew at the hottie-ness of Captain Von Trapp and the girls have learned about the evil-ness of the Nazi Party. In honor of Maria and her charges, here are some of my latest "Favorite Things." Aren't these magnets and buttons cute? I got them in a lovely little package from my good bloggie pal, Steph. 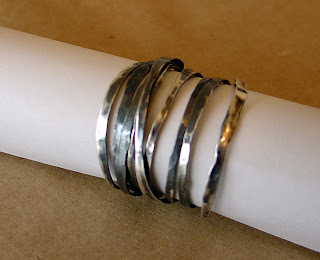 She recently had a give-away on her blog and I was one of the winners. Yay! 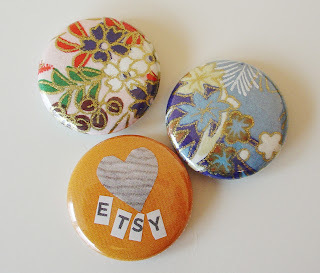 I'm particularly enamored with the Etsy pin. It will be going on my jacket momentarily. She also included one of her moo cards...those are so cute! I'm still trying to decide if I should invest in some but the long box of business cards I just received keeps holding me back. Finally, some of my desk companions. The blue puppy is a pencil sharpener we gave the oldest Kidling for Christmas that I have co-opted. His little ears flap when you sharpen a pencil with his tail/crank. He is also emptied in a surprisingly anatomically correct fashion that the youngest kidling likes to call, "Changing the puppy's diapers." 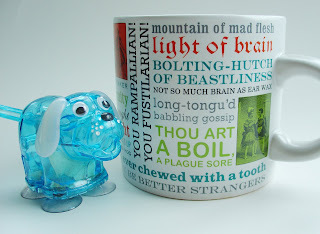 Finally, there is my "Shakespeare Insult Mug." It holds lots of coffee and makes me laugh. I especially like "Not so much brain as ear wax." Really, Captain Von Trapp is just yummy! Such pretty things! And agreed that Captain Von Trapp was pretty darn yum. Where can I get one of those pencil sharpeners?